Here at Zooble Technologies, our aim is to help our website customers to create the most effective website that meets their business needs. Our close project management ensures that we don't just "cut and paste" the content you give us, but we take the time to get to know your business and potential market so that we can effectively advise and assist you to create a professional-looking website that delivers all your key messages to your potential customer market. We don't charge "extra" for website Search Engine Optimisation (SEO) - we believe that this should be naturally built into your website project from the start, and we advise on additional SEO techniques as the site progresses and often into the live "hosting and maintenance" phase. We are extremely proud to boast that once our customers have a website built and hosted with us, we have not had to transfer any out to other suppliers as our customers receive website services over and above that supplied by other website companies. We receive lots of customer feedback and testimonials that bears testament to our excellent customer care, and a few of these are represented below. 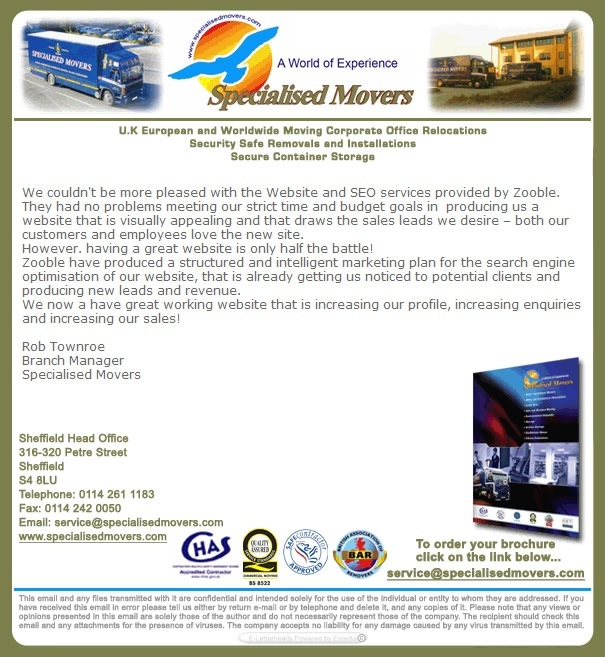 "We couldn't be more pleased with the Website and SEO services provided by Zooble. They had no problems meeting our strict time and budget goals in producing us a website that is visually appealing and that draws the sales leads we desire - both our customers and employees love the new site. "We now have a great working website that is increasing our profile, increasing enquiries and increasing our sales."